The Omega Seamaster Planet Ocean 600M is a diving watch for professional and recreational divers. It is water resistant to 600 m (60 bar, 1,969 ft), features a helium escape valve, and is unaffected by jolts and magnetic fields thanks to its state-of-the-art caliber. Introduced in 2005, Omega dedicated the Seamaster Planet Ocean 600M collection to great oceanographers like William Beebe and Jacques Cousteau. The name Planet Ocean conjures up images of Precontinent, a project aiming to build an underwater settlement undertaken by Cousteau. Cousteau built the habitat in the 1960s in order to investigate the effects of living underwater for prolonged periods of time. With a water resistance of 600 m (60 bar, 1,969 ft), the Planet Ocean is a member of an exclusive group of diving watches. The pressure at such depths is immense: about 60 kg (132 lbs) of pressure per square centimeter. The glass used has to be very stable in order for the watch to withstand this stress. This need is met by the domed sapphire crystal glass used in the Seamaster models. Omega uses this synthetically created glass for the case backs as well, giving the wearer a view of the movement. A second crown at 10 o'clock functions as a helium escape valve. This is especially interesting for professional divers who take part in saturation dives. The valve allows any helium that enters the watch to escape, thus avoiding any potential damage to the watch itself. Omega offers this diving watch with cases made of stainless steel, titanium, gold, or ceramic. In addition to the three-hand models, there are also those with a chronograph or a second time zone. These timepieces come in sizes for both men and women, with cases ranging from 37.5 to a massive 45.5 mm in diameter. How much does a Planet Ocean 600M cost? 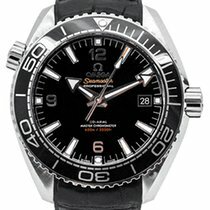 Detailed Price Information The Planet Ocean collection is vast and covers a huge price range. Older models from the early 2000s mark the entry point into this collection. Expect to pay around 4,300 USD for a three-hand timepiece with a bright orange aluminum bezel. Current stainless steel models cost about 4,900 USD. Those with a titanium case come in at around 6,100 USD. If you're looking for a Planet Ocean in Sedna gold, be prepared to spend around 17,800 USD. The 18-karat white gold model occupies the top of the price range. It is limited to a run of 88 pieces and features baguette-cut diamonds and sapphires on its bezel. Set aside around 64,100 USD for this exclusive timepiece. At 5,800 USD, the stainless steel GMT models are almost a bargain. The stainless steel chronographs sit at a similar price point. You'll need another 1,200 USD if you want to purchase a titanium chronograph model. There are also gold chronograph editions, which sell for around 22,700 USD. The Ladies' Planet Ocean collection is aimed specifically at women and has a similar price range to the men's collection. The cases range from 37.5 to 39.5 mm in diameter, and the prices fall between 4,900 and 16,300 USD depending on the material. The Planet Ocean has been available with a ceramic case since 2012. The Deep Black models are made of black ceramic, while the Big Blue gleams in a radiant blue. Omega equipped both versions with a GMT function, which can display a second time zone. Whether its black or blue, you will need about 8,500 USD for one of these timepieces. Variants with Sedna gold elements, including the bezel, crown, and hands, change hands for around 11,400 USD. Fans of sailing should enjoy the edition designed for the Emirates Team New Zealand. The main difference between it and the other Deep Black models lies in the color of the bezel. The first ten minutes of the ETNZ version features New Zealand's national colors: blue and red. The case back is also different. Instead of sapphire glass, the case back on this model is ceramic and is engraved with the ETNZ logo. Prices for these timepieces come in around 8,600 USD. The Deep Black is also available with a stopwatch function. Orange accents on the bezel, push-pieces, and rubber strap lend this chronograph its fresh appearance. Set aside around 9,000 USD for a Deep Black chronograph. The Planet Ocean collection includes a few special models. 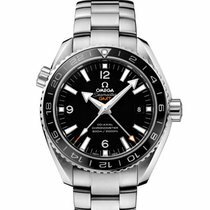 Models like the Planet Ocean Skyfall and the Planet Ocean Quantum of Solace are dedicated to secret agent and long-time Omega wearer, James Bond, and the eponymous films. Each is limited to a run of 5,007 pieces. You can purchase one of these diving watches for between 4,900 and 7,800 USD. Omega has long been the official timekeeper of major sporting events, such as the Olympics. These events often see the release of a special model from Omega: for example, the Planet Ocean Olympic Games Chronograph and the Planet Ocean Pyeongchang 2018. Prices for these timepieces range from 4,900 to 7,800 USD. Olympic record holder, Michael Phelps, also has an Omega watch dedicated to him. This 45.5-mm chronograph features a white dial with blue hands and indices, which is livened up by a few orange accents. The bezel follows the same color scheme: Here, blue ceramic meets white numerals and an orange rubber inlay for the first 15 minutes. The rubber strap is also blue and orange. On the sapphire glass case back, you will find the elite athlete's name and initials. With a limited run of 280 pieces, this watch sells for around 8,800 USD. COSC-certified, chronometer calibers power every Planet Ocean. What's more, Omega has been outfitting them with their in-house co-axial escapement since the very beginning. This escapement protects the watch particularly well against jolts. Omega has since gone a step further and has been outfitting current models with their so-called "Master Chronometer calibers" since 2017. These movements are very precise. Thanks to the use of silicon, they are even unaffected by magnetic fields up to 15,000 Gauss. The Swiss Federal Institute of Metrology (METAS) certifies this in a time-consuming testing process.